This power pack might be small, but it’s still able to power all your essential devices. Battery packs might not seem that exciting, but they play a significant role in fueling the average person’s demanding lifestyle. The market is starting to heat up with a variety of devices which are built to be smaller and more powerful than ever. RIVER is a mobile power station designed to fit virtually anyone’s busy lifestyle. Although it comes in a small form factor (9.8” x 6.3” x 8.3”, with a weight of 11 pounds) it’s designed to pack significant amounts of power. For example, it can charge a laptop five to nine times, a phone 30+ times, and a drone four to eight times. It’s also designed to power a refrigerator for 10+ hours or a household light for 100+ hours should that be required. In all, the device has a 412Wh capacity with a total output of 500W. In all, RIVER can simultaneously charge up to 11 devices, up to 500W, with a variety of ports. These include a universal DC input, 2 USB-C ports, 2 AC outputs (300W total), 2 DC outputs, 4 fast-charge outputs (2 Type-C QC 3.0, 2 USB QC 3.0), and a 12V car port. It also is built to hold its charge for up to a year and is designed to last through 500 power cycles. What’s notable about the power station is the ability to charge it using a car jack (nine-hour charge time), an optional solar adapter (10-15 hour charge time), and through a standard wall socket (six hour charge time). 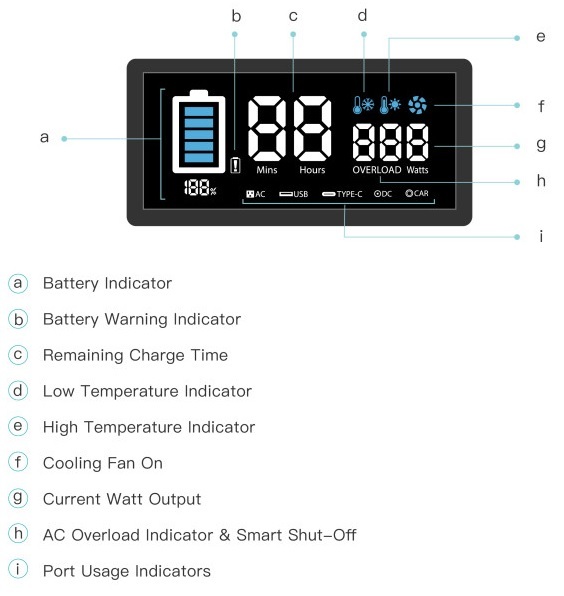 There’s also an LCD which shows a battery indicator, battery warning indicator, remaining charge times, low-temperature indicator, high-temperature indicator, cooling fan status, current watt output, AC overload indicator, and port usage indicators. Although running a device with significant amounts of power can seem unsafe at times, RIVER is equipped with intelligent battery software which protects the device from surges and overheating. It’s also designed to deliver alerts should there be any changes in operating temperature. So far, the makers of RIVER have raised over $445,000 via crowdfunding with an estimated shipping date of July 2017. The device comes in two colors, white and black. Early bird pricing for the device starts at $499 which is 30% off the suggested retail price. The element proof protective case sells for $59, the 21-watt solar charger sells for $129, and the 50-watt solar charger sells for $249. Each RIVER pre-order comes with a wall charger, car charger, DC cable, Type-C cable, and DC tips. This could change the portable battery market for sure! Being able to power so many things and charge rather quickly is a main feature that should not be taken lightly. I was wondering when I would see something like this. Power banks are a hot seller and being able to have power when you need it can save your life. I am happy to see the portable power stations getting more powerful.